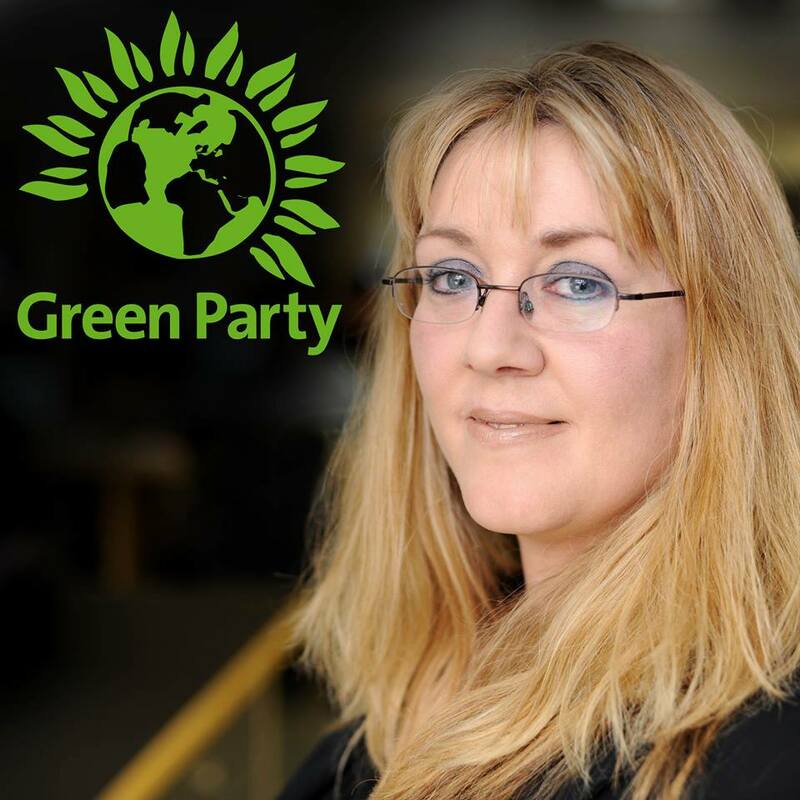 Councillor Julie Howell, Green Party, Orton Waterville Ward, Peterborough, Cambridgeshire. For Orton Waterville, Orton Brimbles, Orton Goldhay, Orton Northgate, Orton Southgate & Orton Wistow. With occasional posts from Orton volunteer Nicola Day & parish councillors Alex Airey & Barry Warne. The end of another year is inevitably a time of thoughtful reflection. It's been an interesting year, hasn't it? Our worlds have been rocked by a succession of 'celebrity' deaths and the EU Referendum resulted in a change of prime minister and months of confusion and uncertainty about what BREXIT will mean and when it will happen. Closer to home, graffiti, drifting, vandalism, long grass, dog poo, litter, flytipping and dangerous driving were just some of the issues that brought you into contact with me. But is wasn't all bad. 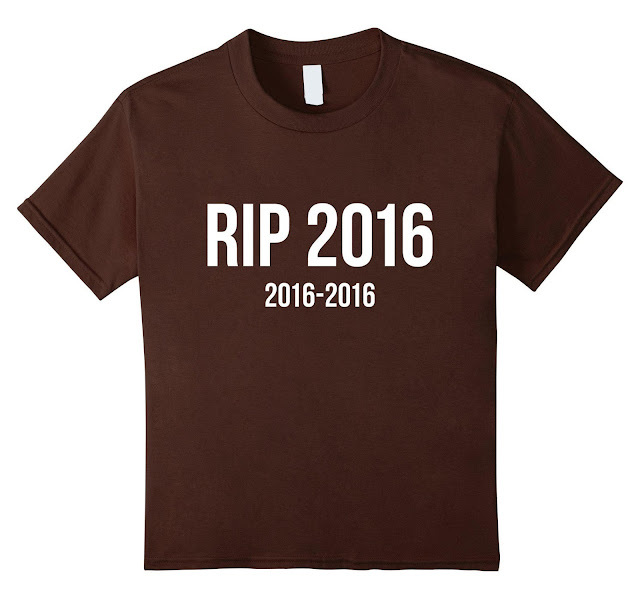 No year ever is. 2017 will also be a challenging year. It's worth taking a moment to reflect on all that was good about 2016 and to make a special effort to notice all that is good in the year ahead. On 20th March my life changed beyond measure when one of my fellow parish councillors suggested that I might stand in the Peterborough City Council elections on behalf of the Green Party. 'What's the worst that could happen', I remarked as I agreed to do the 200 or so Green voters of Orton Waterville ward the 'favour' of providing a name for them to vote for on the ballot paper. Little did I know that Orton Waterville was on the cusp of becoming the 'Greenest' ward in the whole of Peterborough. I came to the election very late and with no experience of standing as a candidate. 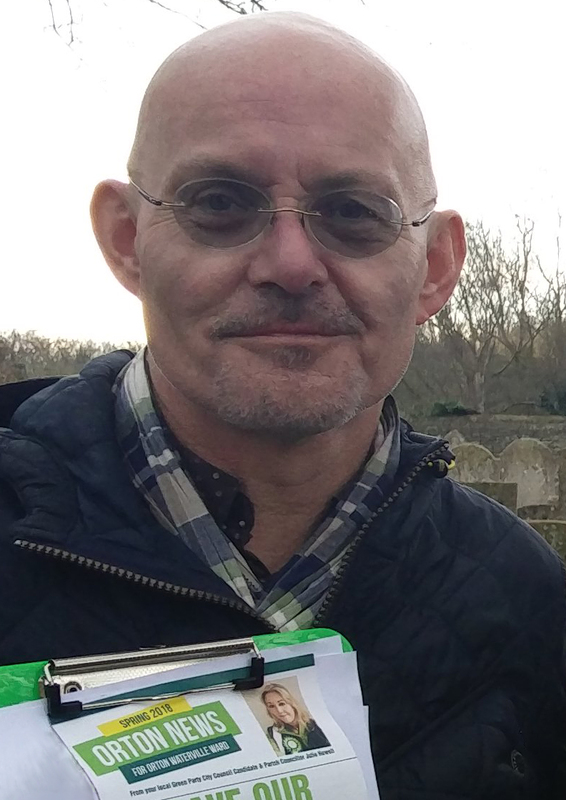 With the help of Peterborough Green Party volunteers, I managed to put a leaflet out to 4200 homes, but not before many had already returned their postal votes. Coming any better than 5th place seemed an impossibility. 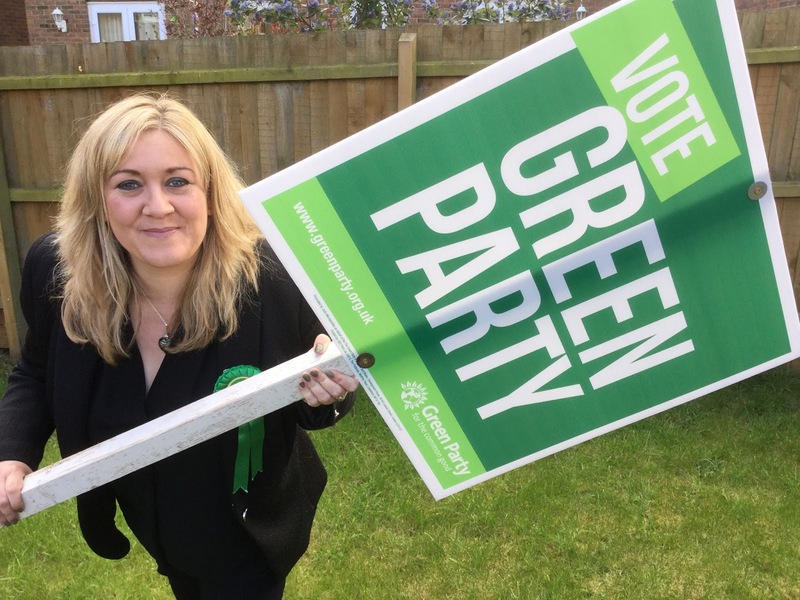 No one was more surprised than I was to learn that 565 residents voted for me, your Green Party candidate, on 5th May. The Green Party came third in our ward, just 42 votes behind UKIP! The warmth of your support and the level of your engagement with me was overwhelming. I did not expect it at all. A 'simple' act that began as a favour quickly became a cause to which I am now pleased to dedicate all of my time. In the months since, I have met so many of you and struck up true friendships, laughed and cried with you, shared in your frustrations and your joys. It has been the greatest privilege to serve you and now I cannot imagine life any other way. Thank you. I wonder where you'll take us next. You received four leaflets from me this year. But how did I manage to deliver 16,800 leaflets to doormats across Orton? I just write the leaflets. The delivery is done but a small but faithful army of 'Green Leafleteers'. In all weathers and without a single complaint, this gang of hardy letterbox-stuffers march on Orton Waterville ward to get my message to you. All are volunteers, driven solely by their desire to help me to reach you. In all my years, I've never seen a team like it. 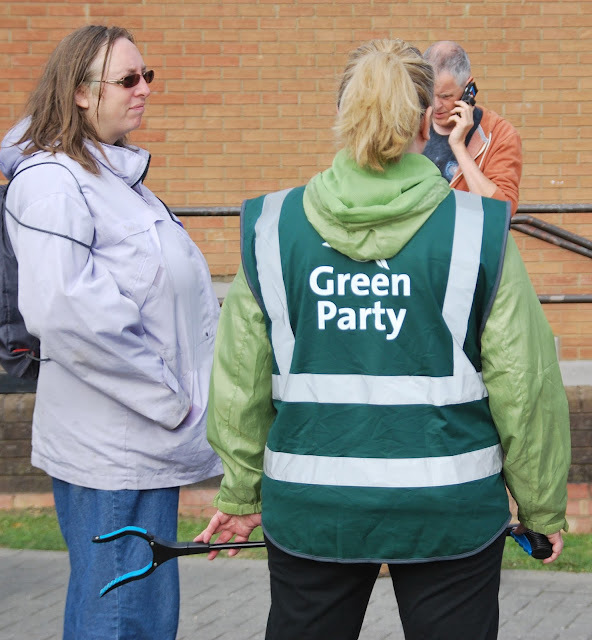 In fact, I've never worked with a team like Peterborough Green Party. We don't have the money or the resources of the larger political parties, but in no way does this restrict anyone's beliefs about what it is possible. Life as a local politician is very bumpy, with high highs and low lows. It is as exhilarating as it is exhausting. What you need more than anything is a team that has your back, that will turn up on your doorstep just to ask how you are and will get stuck in with your latest mad idea with lots of great questions but no complaints. 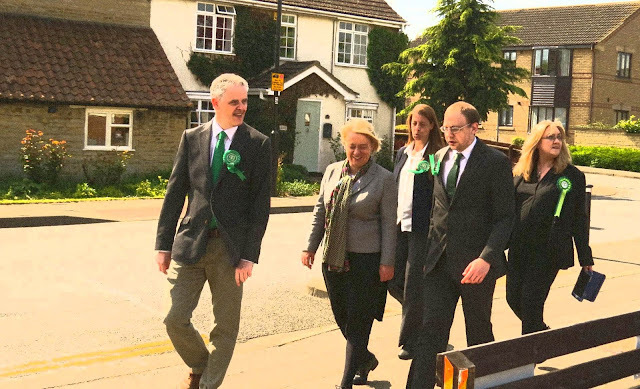 In September, they made me joint coordinator of Peterborough Green Party, along with my outstanding colleague Roger Proudfoot. And while I can't tell you about everything that goes on behind the scenes (as our political opponents avidly read my blog!) what I can say is that our team is my energy and it is they who make it possible for me to help so many of you by quietly and conscientiously getting on with doing the various essential tasks that free up a politician to do what matters most: listening to residents. I don't appreciate litter. However, I do appreciate the efforts we're all making to clear it from our streets. This year, I took part in countless litter picks around Orton. Some were arranged by Peterborough Green Party, others by local residents and there was even a litter pick around the Lynchwood Business Park organised by staff of the Marriott Hotel (accompanied by 13 4-year-olds from a local nursery). None of those who joined in the effort to pick the litter up was responsible for dropping it. You may believe that it's the council's job to pick it up anyway. You're right, it is. But so much litter is being dropped around Orton that the council cannot possibly keep up with it. Imagine how pleasant our surroundings would be if we all picked up litter that we didn't drop. I've stopped seeing litter as simply a nuisance and started to take pleasure in helping to remove it from our streets. Why not join us on one of our litter picks in 2017 and share in the feelgood. Writing for you is a pleasure. I receive a lot of emails and phone calls from residents who have enjoyed my leaflets and my blogs. It is my pleasure. I like to keep up my writing (I'm a published author and write for Nene Living magazine about the exploits of my dog!). I love conversations too and I'm looking forward to many more conversations with you in 2017. 2016 is about to be behind us and 2017 lies ahead, full of possibility and a little bit of trepidation. There's another election on the horizon. On 4th May 2017, you will be asked to choose a mayor of the new Peterborough and Cambridgeshire Combined Authority. Although the EU Referendum resulted in a lot of turmoil at least one positive has come out of it: many people used their right to vote for the very first time in their lives. It is my dearest hope that new voters will continue to exercise their democratic right, a right that was hard won in our country and a right that continues to be denied in other counties around the world. May the 4th. I'll remind you. I've had a bad week. A cold became raging tonsillitis, which became a raging dental abscess which has laid me low for the past seven days. I'm not a particularly patient patient. What gets me through the misery of these acute, seasonal illnesses is knowing that in a matter of days I'll be back to full health (which I will be very soon). Being stuck at home hasn't meant I've been cut off from the world. I have watched with growing horror how the abscess in my mouth has become the perfect metaphor for the abscess in our Town Hall. As the entire world now knows, Peterborough City Council (to be fair, not every single one of the city councillors, but a core group of Conservatives) continue to treat the homeless people in our city with utter contempt. 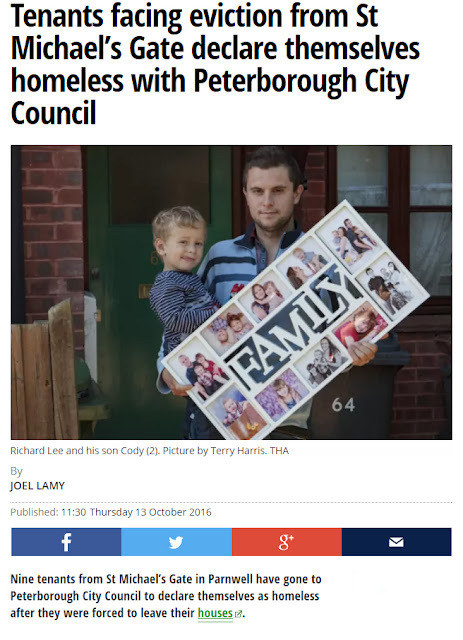 You have already read how Peterborough City Council has made 74 families homeless in order to provide emergency accommodation for other homeless families. If you thought national embarrassment, including a basting on BBC1's The One Show, would have been more than enough to make the city council think very carefully about how it treats homeless people in the future you would be just like me: dead wrong. 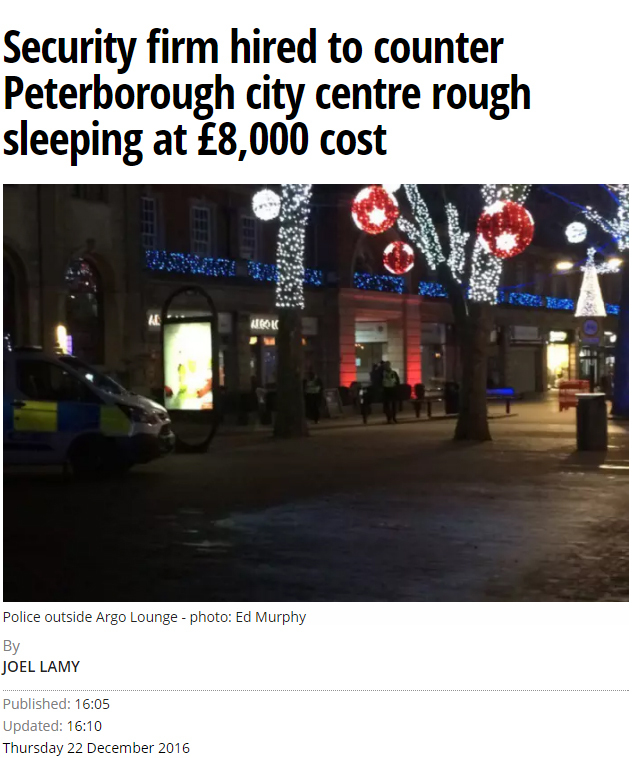 On Thursday, the Peterborough Telegraph reported that Peterborough City Council has hired a security firm to 'patrol Peterborough city centre to remove rough sleepers' for 19 days over the Christmas period. 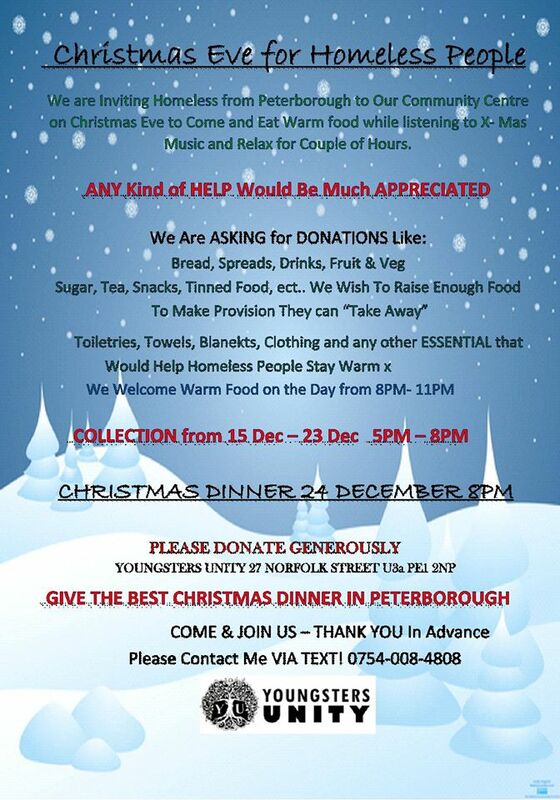 If you're a Peterborough resident your council tax is paying for this 'service' to the tune of £8,000. The area of 'Peterborough city centre' that is of particular concern to the city council is a passage known as St Peter's Arcade, which is a literal stone's throw from the Town Hall on Bridge Street. First St Michael's Gate, now St Peter's Arcade. If you live on a street named after a saint perhaps you ought to start looking over your shoulder too (I think I'm joking). I wonder, when you voted for your city councillors, did you think you were voting to give them permission to spend your money in this way? I felt well enough to take a trip out today (Christmas Eve) and wandered down to St Peter's Arcade. There are still people sleeping rough there. Clearly, it doesn't please me to think of anyone sleeping rough in our city. Nor am I pleased that £8k that might have been spent on something positive for our city's homeless people has been spent on what appears to be little more than an exercise in personal vanity and public flexing of muscle by the city councillors involved. But I smiled inwardly to see that the city council's attempt to 'vanish' our homeless people from our streets has failed. Because it's not legal you see. So it's both a disgraceful treatment of fellow humans and a disgraceful squandering of public money. I surely speak for growing number of residents when I say that we don't want the people who are homeless to be 'vanished' from public view like so much fly tip. People become homeless for myriad reasons and once homeless the struggle to get life back on track is mammoth. Just this week, the charity Crisis published a new report highlighting the abuse that rough sleepers routinely face on British streets. Now Peterborough has been linked with this report in the worst possible way (read this article in The Mirror - that's our city they're talking about). 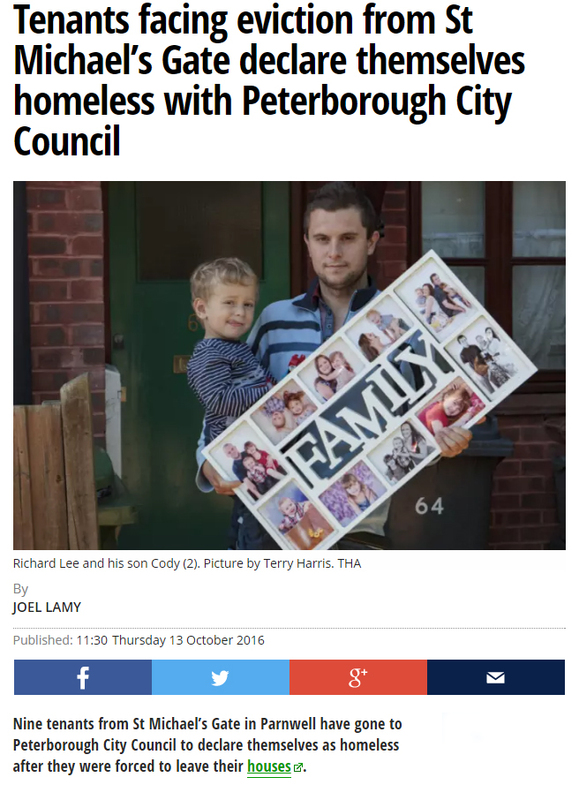 I can say with certainty that the people of Peterborough are characterised by kindness, sympathy and understanding towards people who are going through hard times, and these increasingly bizarre decisions taken on our behalf but without any consultation by the city council are considered by many people here to be nothing short of a disgrace. St Peter's Arcade is situated opposite another seasonal city council project that many residents find offensive: the £40k glowing pyramid that is supposed to pass for a Christmas tree. Ask most Peterborough people and they will tell you that they want a real tree, decorated with baubles and lights and a fairy on the top. You know... Christmassy. I'm quite sure we could have just that for less than £40,000. The council justifies the spend by insisting that it will be used year after year. Well, it would have to be used for at least a decade to stand a chance of being more environmentally friendly than an annual succession of real trees owing to the huge carbon footprint created by its production. I don't wish to be crude, especially at Christmas (there has been more than enough of that already), but there's more taste in my mouth, particularly since my abscess burst. It's easy for me to write this. What difference do words make? This afternoon, on behalf of Peterborough Green Party, my colleague Roger donated snacks and warm clothing to Youngsters Unity, an organisation in Peterborough that tonight held an event for our city's homeless people where they could have a warm meal and food and some clothing to take away with them. I know that's a small gesture and it didn't cost us very much. But doesn't it make you think what good £48,000 could do? Antibiotics have cleared up my tonsillitis and soon my abscess will be drained and gone because I have received the right care at the right time to get me back on my feet. Homelessness is a complex issue that requires a sensitive, long-term, multi-agency response that recognises that homeless people have genuine and complicated needs and that doesn't seek to either vanish or criminalise them. 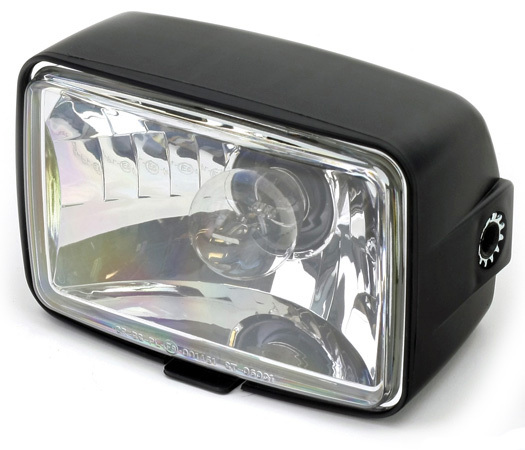 Earlier this month, I told you about a terrible accident in Peterborough involving a young man riding an illegal mini motorbike on a residential road at night with no helmet and no lights. Over the past few years, young people riding these bikes anti-socially around Orton - and Orton Goldhay in particular - have caused great distress to residents, who have long feared that an accident could happen. Young people on illegal bikes on our residential roads and pavements are a danger to themselves and everyone else. Thanks to the internet, it's now easier than ever to acquire one of these bikes and many of the models you can buy online are cheap, poorly constructed and dangerous. While people continue to ride these bikes illegally accidents will continue to happen. It's easy to criminalise these young riders, but doing so doesn't tackle the issues at the heart of the matter in our community. You may be thinking that the Green Party and a project that encourages safe use of environment-polluting mini motorbikes would not be comfortable bedfellows. However, we are just as concerned about our natural environment as we are about the built environment that people live in. It has become very clear to me that mini motorbike enthusiasts in Orton have nowhere to go to ride their bikes safely and legally. Instead, they bomb around Goldhay with no lights, no helmet and no idea of how to ride responsibly. For the safety of everyone and the protection of our residential environment this is something we have to address. 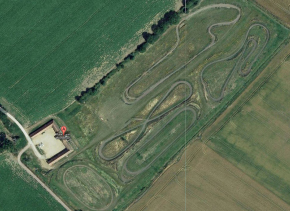 When I appeared on BBC Radio Cambs to talk about the accident and the problem of mini motorbikes in Orton Goldhay, I was introduced to a gentleman called Wayne Arbon who is involved in running the Gauntlet Auto Project in Ramsey, ten miles outside Peterborough. 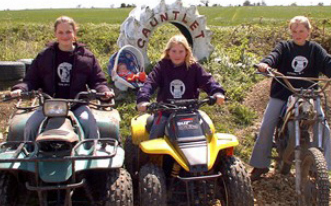 Established in 1995, and registered as a charity, the Gauntlet Auto Project is a Saturday morning club for young people who would like to learn how to ride mini motorbikes, discover how to ride properly and responsibly and find out how to maintain their bikes to ensure they are safe and in good working order. The sessions run on Saturday mornings, 10am-12:30pm. Each session costs £10, or £7 if you have an annual membership of the club, which costs £30. 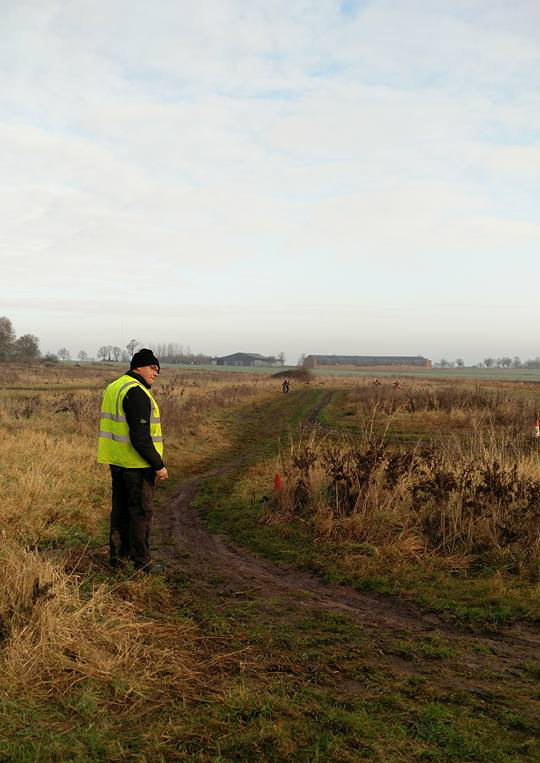 Set in seven acres of beautiful farmland, the club has taken care to protect the natural environment that surrounds it, installing bug hotels and bird boxes to encourage nature to thrive. to ride to suit different levels of skill and experience. fix and maintain their bikes. Not just for the boys! I saw several girls on bikes today. The project welcomes boys and girls, people with all kinds of disabilities (Wayne told me they recently held a session for deafblind children who had a fantastic time!). There is no problem! The project just needs more publicity and more funding. And for young people in Orton who can't easily get to rural Ramsey on a Saturday morning it also needs the help of our local community to arrange a minibus to take them to and from the venue. Riders take their turn around one of the six tracks. We're really keen to help this project to thrive. If you live in Orton and would like to go to the club but need help with transport to get there, please let me know. If there is enough interest, we may be able arrange a minibus. Of course, motorbikes do have a negative effect on the environment. However, projects like this can build riders' awareness of this and encourage them to maintain their bikes appropriately, make the more ethical consumer choices where possible and ride in a manner that is respectful of air quality and wildlife. 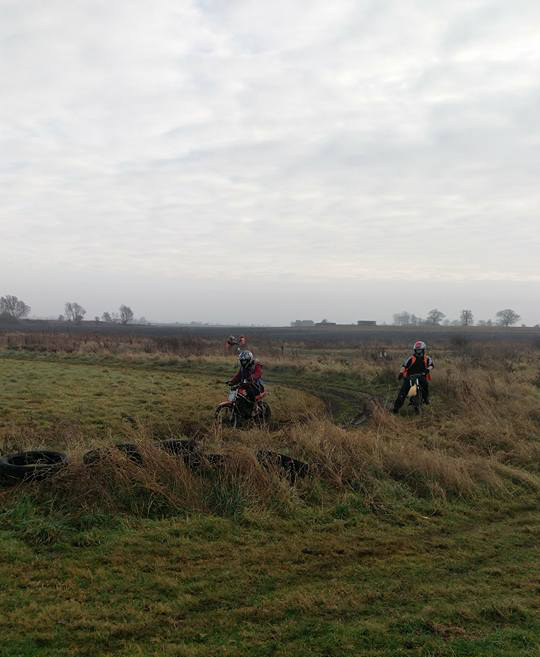 The difficulty with motorbikes in general is that they run on unsustainable fossil fuel, namely petrol. One of the most serious effects of these mini motorbikes is their contribution to climate change by producing carbon dioxide. The Green Party is keen to dramatically reduce the production of carbon dioxide from all methods of transport. We endorse walking, cycling wherever possible, car-sharing, and the use of busses and trains. However, public safety and an end to anti-social behaviour concern us too, and while ownership of these mini motorbikes continues to surge we want parents (who pay for them!) and young people to acknowledge all of the dangers associated with these bikes: the safety concerns, the anti-social behaviour and the effects on the environment. This facility is a treasure. It is run almost entirely by volunteers whose dedication to helping young people is very humbling. To keep any project going for more than 20 years in an incredible achievement, especially considering Cambridgeshire County Council recently halved the amount of grant money that it makes available to the project (a fact that saddens me greatly). We've grown very used in Orton to venting anger and frustration at mini motorcyclists and with good reason. But you should see what I saw today. 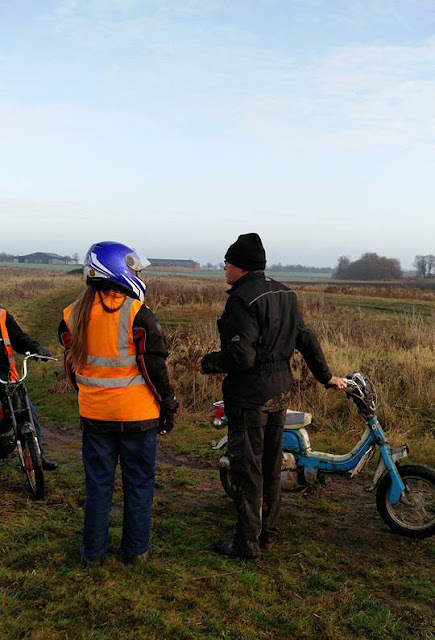 Thirty young people fully engaged in learning how to ride mini motorbikes correctly and responsibly in a safe environment under the watchful eye of caring and experienced volunteers and fellow bike enthusiasts. I didn't see anyone messing about or causing problems. Wayne tells me that after a short time with the club, kids who had driven anti-socially in the past start to take pride in doing things the right way. This is exactly the sort of project we should all embrace. To find out more visit the Gauntlet Auto Project website. You must have heard about the disgraceful situation across town at St Michael's Gate in Parnwell. A private company has made available to Peterborough City Council accommodation to house some of our city's homeless people. Sounds like a good idea? It isn't, because the properties concerned are already occupied and to make them available to homeless families the people who currently live in these homes are being evicted. You have understood this correctly. People are being made homeless to free up housing for homeless people. If they can do it in Parnwell, they can do it here or anywhere. Much has been written about this disgraceful situation in both local and national media. In particular, our Peterborough Telegraph is doing a fantastic job of shining a spotlight on the misery that the newly homeless women, men and children of St Michael's Gate presently face. Women, Men, Children. A Community. The text you see above is an excerpt from a letter from Peterborough City Council to the Local Government Association, calling for local councils to work together so that the situation that has arisen at St Michael's Gate cannot happen again. The intent is laudable. The language is deplorable. Brilliant people of Orton Waterville ward, would you agree that 'homeless households' is an oxymoron? How can a person be both homeless and have a house at the same time? The phrase the city council is desperate to avoid using is 'homeless women, men and children'. 'Homeless women, men and children' has an emotional resonance. It's a phrase that can put a lump in your throat. It makes me think of 'humanity' and 'caring'. 'Homeless households' on the other hand, is clinical. It creates distance between 'them' and 'us'. It makes me think of the bricks and mortar, rather than the loving community of friends and families that is the beating heart of St Michael's Gate. And do you know, that's exactly what it's supposed to do. We use language to distance ourselves from emotional discomfort. To dissociate from it. Our use of language can change the way we think and feel and it can also change the way other people think and feel. It is that powerful. Sometimes, that's a good thing. Sometimes, it is helpful to use language to distance ourselves emotionally when we need to deliver bad news or when we are in a professional or formal situation, such as a job interview. 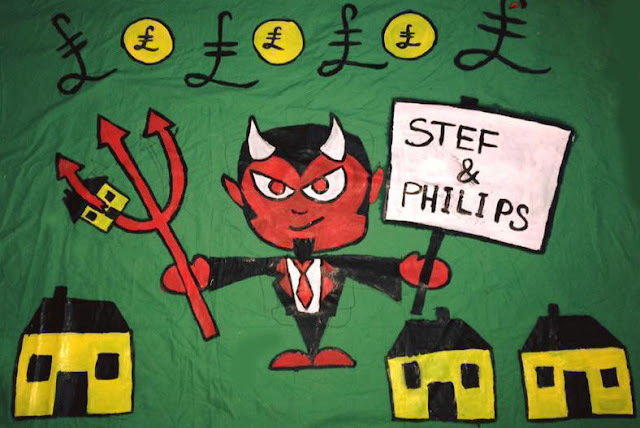 However, when it comes to the wellbeing of the women, men and children who find themselves facing eviction just before Christmas through no fault of their own, dispassionate, dissociating language enables people in power to inflict great harm and injustice when they otherwise might be more compassionate. 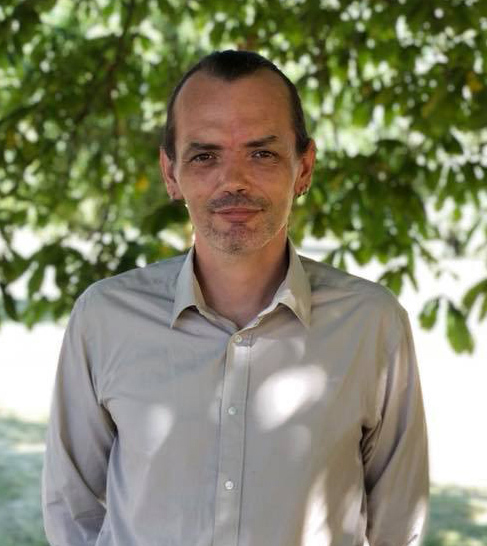 This evening, at a meeting of the full Peterborough City Council, St Michael's Gate resident and campaigner Jelana Stevic made what Joel Lamy, reporter with the Peterborough Telegraph described as 'a hugely passionate speech'. It is with regret that this passion will be sieved and strained through the medium of the council chamber until all humanity is lost. This is human suffering that has come to pass via policies and procedures that de-humanise people. It is very easy to make decisions that affect the well-being of women, men and children when you use language that removes their humanity. Let's stop doing this. Let's stop de-humanising people. Let's create policies and pass laws that protect people and help them to feel secure. And let's always put people are the heart of our decisions and take greater care with our language. And so it is for the women, men and children of St Michael's Gate. Please support Action for St Michael's Gate on Facebook. Everyone saw an accident coming. Everyone, except the lad on the bike and the poor driver whose car unavoidably hit him. Just before 9pm on Thursday night (1st December 2016), a lady driving a Chevrolet Spark along London Road in Fletton Hempstead, Peterborough collided with a man in his 20s who was riding a mini motorbike. The biker wasn't wearing a helmet, there were no lights on his bike and, according to some unverified witness accounts that I read on social media, he jumped a red traffic light. The lady driving the car had no opportunity to take evasive action and the motorcycle and its rider ended their journey under that car. Our treasured MAGPAS air ambulance took the young man to hospital and it is reported that he has sustained 'life-changing injuries' including a broken pelvis. The driver of the car is, mercifully, unharmed. The motorcyclist (and his friends and family) have learned a very hard lesson in the worst way possible. These bikes are not road legal for a reason. Even if they were, riding without a helmet is foolhardy. Riding without lights could kill someone. If you ride in the dark on public roads without lights on your bike you're invisible. No matter how carefully you think you're riding, if you cannot be seen then you're putting everyone in range of you at risk of great harm. Yesterday, I gave an interview to the BBC Radio Cambs Breakfast Show expressing my concern about these mini motorbikes. Although the request for an interview was triggered by this incident, I have long voiced concerns about anti-social behaviour involving these bikes in many areas of Peterborough, including Dogsthorpe, Werrington and Orton. Many residents of Orton have spoken to me about their anxieties regarding these bikes and the aggressive and anti-social attitude of the young people who ride them on the pavement, often narrowly missing pedestrians and certainly terrorising them. Residents also complain very bitterly that the police rarely respond to their reports about the mini motorbikes, despite it supposedly being a priority for police in Orton. Calls to 101 are frequently dismissed and if they attend at all, the police tend to arrive long after the rider has left the area. Evidence of the problem is difficult to capture as the bikes travel so fast, with no licence plates to identify them, and the riders usually cover their faces with scarves to hide their identity. Unsurprisingly, this has led some residents to describe parts of Orton as 'lawless', with many believing that neither the police nor the council cares about them. If you're riding a bike you and your bike should always be safe, road legal and visible. Venturing out without lights on your bike at any time of day is risky and at night it is extremely dangerous. 'Life changing injuries' generally means 'will never walk again'. This is a terrible life sentence for a person in their 20s. Put lights on your bike, even if you don't agree that you need them. They will one day save your life and probably someone else's life too. 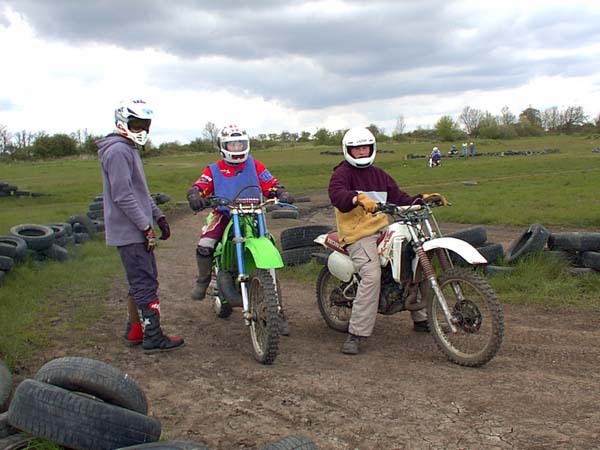 While some riders mean no harm, a considerable number of mini motorbike riders in Orton deliberately ride anti-socially, terrorising families, older people and pets. Putting people's lives at risk. Where those riders are concerned the police must intervene. 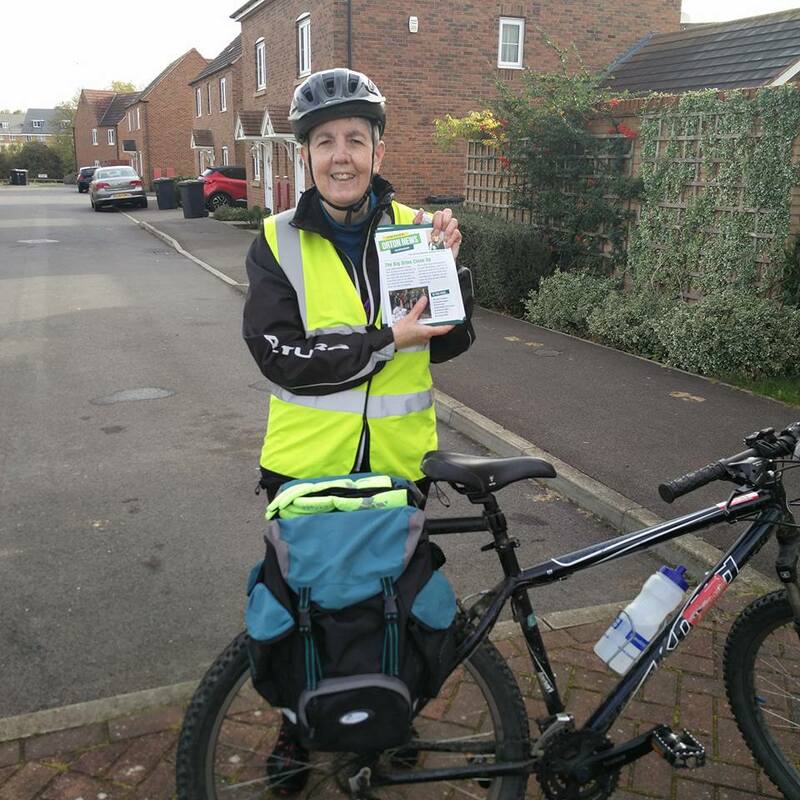 On 5 June 2016, Community Inspector Kate Firman of Safer Peterborough Partnership wrote in the Peterborough Telegraph about seizing bikes and issuing warnings to anti-social riders, and yet the problem seems to be worse than ever. I don't know whether the 101 operators are failing to handle the calls correctly (we know this happens sometimes when 'drifting' is reported) or whether the police are simply overwhelmed. However, it's very clear that residents feel a more visible police presence in the community and a faster response when crimes involving mini motorbikes occur would make a difference. Peterborough is a property paradox. We have a desperate housing shortage (depending on whose 'facts' you choose to believe). At the same time, our newer housing estates are cramped. Planning that probably made very good sense on paper has led to narrow streets and areas of very dense housing. People in some areas feel that they are living on top of each other. And as new estates are built, where is the infrastructure needed to create communities? Is it any wonder that young people are using residential streets for recreation? If you are interested in mini motorbikes, where can you go in Orton to ride them safely and legally? 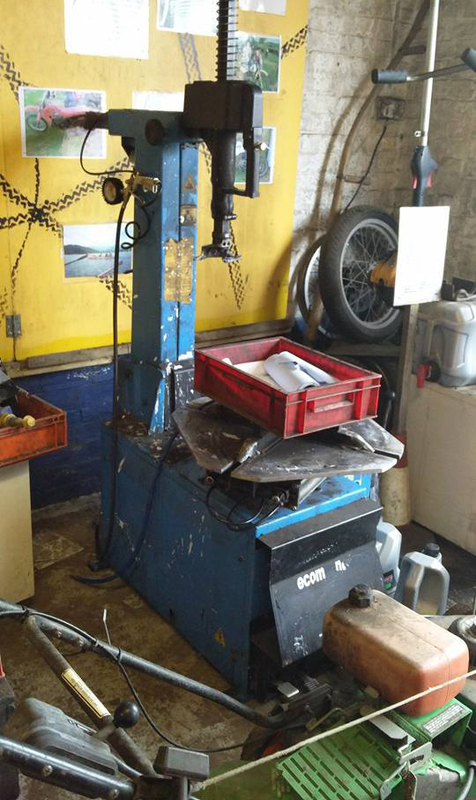 If you listen to the BBC Radio Cambs interview on the link above, you'll also hear from Wayne Arbon of the Gauntlet Auto Project. This business operating in Ramsey provides a place for mini motorbike enthusiasts to ride safely and teaches them how to maintain their bikes to keep them in good working order. Wouldn't it be great if we had such a facility in Peterborough? What do you think is the answer the problems caused by young people riding mini motorbikes illegally and unsafely in Orton? 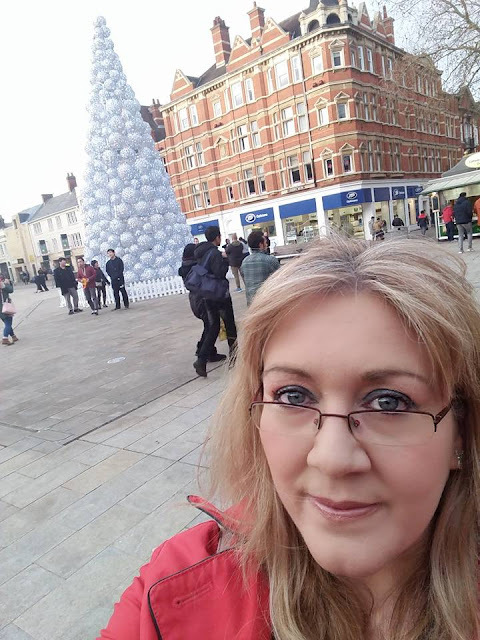 Audio transcript: Dotty: Now the use of mini motorbikes in Peterborough has reached epidemic proportions, that’s according to a member of the city’s Green Party. Julie Howell says people riding them without lights and helmets are a hazard to residents as well as themselves. Last night in the city, a rider on a mini motorbike was reported to have sustained life-changing injuries after a collision with a car on London Road. Julie Howell joins me now. Good morning. I mean epidemic proportions Julie, what do you really mean by that? Julie: Good morning, Dotty. Well the first thing that I’d like to say is how terribly sorry I am for everyone involved in that accident on Thursday, particularly the driver of the car. It sounds absolutely horrific. Now, we call this epidemic proportions because we have been complaining about this for over two years now. It’s a problem in Werrington, in Dogsthorpe, in Orton, various places across Peterborough. We’ve told the police time and time again we’ve got a real problem with people driving these off-road bikes, these illegal bikes. They’re not wearing helmets, well, that’s their risk, isn’t it? But they’ve got no lights on their bikes and this is a huge risk to everybody. Dotty: And you said that you feel particularly sorry following this accident on Thursday night for the person who was driving the car that was involved. I mean it was the rider of the motorbike that has suffered such serious injuries. Julie: And it sounds like it was a miracle the person behind the wheel of the car wasn’t injured or indeed any pedestrians passing by because I believe this was round about 9pm, a very busy time. I know that location well. It’s quite a built-up residential area and if you’re riding a bike with no lights on then you are responsible for any accident that happens, absolutely right. I’m sorry someone’s hurt themselves but this was bound to happen if you ride in the dark with no lights on. Dotty: So what really is the problem, especially if these kids are, you know, just knocking about, if they’re just having a bit of fun, I mean, is it really a big deal? Julie: They’re not just knocking about though. I’ve spoken to many residents about this over the weekend and certainly what we find in Orton is that there’s a lot of very anti-social behaviour there with these bikes. The kids who are riding the bikes, I say kids but it’s also young people in their 20s, are riding them with their faces masked by scarves so they know they’re doing wrong and they don’t want to be identified and they’re driving along pavements, they’re putting children at risk. It’s something we’ve raised with the police many, many times and it’s just a matter of time before a pedestrian is really badly injured or killed. Dotty: Yeah, I mean in the last six months we’ve spoken to you Julie about concerns over fly tipping, over drifting and now mini motorbikes. You say you’ve complained about all of these things to the relevant authorities for months at a time. Do you feel that Peterborough is being effectively policed? Julie: Some parts of it you have to wonder, don’t you? I don’t think this is entirely a policing issue. Clearly, we need to tell our young people to put lights on their bikes. That’s really important. And I know that some residents feel, as I do, that we need some place for people to be. Peterborough’s becoming so built up with new housing, it doesn’t have great transport infrastructure, and people will always as they have since motorbikes were invented, wanted to muck about on them. So they need somewhere safe to be able to do that. But for years residents have been complaining to police about this sort of thing and they’re feeling terrorised now by these young people and I doubt hearing about this accident on Thursday is going to make any of the residents feel any better about it. Where are the police? Where’s the presence? Where are the police telling these riders if you don’t have lights on your bike it’s not just your own life you’re putting at risk it’s the life of anybody who is unfortunate enough to get in your way. Dotty: What do you think should be done about this? Julie: Education about how important lights are. I can’t believe that we’re saying this. Isn’t it obvious? If you choose not to wear a helmet it’s on you. If you choose not to have lights on your bike that could affect all of us. And somewhere for people to be so that they can do this and they’re not doing it out on our streets. Dotty: Okay Julie, thank you very much. Julie Howell there from Peterborough Green Party, concerned about the number of mini motorbikes being ridden illegally around Peterborough. This site is a personal blog and I am responsible for its content. Organisations I belong to or work with are as free as any other reader to agree or to disagree with my views.